Why Are There Cracks in the Timber of My New Timber Frame Structure? You may think it’s a flaw in the timber used, but rest assured, it’s not! Cracking and checking is a normal part of timber frame buildings, fences, and furniture and is very rarely a result of any structural issues. Cracking and checking of timber is actually a very natural part of the life cycle of wood – even once it’s been cut, shaped, and prepared for building. It isn’t an indication of defects in your wood, though sometimes customers assume so. Checking is the separation of grain that occurs in timber as moisture levels change and timber dries. It looks like cracks and splits in the wood. Why is my timber cracking and checking? Cracking and checking is a side effect of timber/wood trying to reach a natural equilibrium with its environment. It occurs because wood shrinks as it dries. Have you ever noticed that at certain times of year, the doors in your homes seem to close smoothly and easily, while in other seasons they swell and are a pain to latch? That’s the swelling and shrinking of wood responding to its surrounding atmosphere. Timber starts drying from the outer layers inward in order to reach a balance with its environs. As the outer layers dry and shrink, the moist, hard center (or heart of the wood) don’t give them room to shrink or compress. The cracks and checks are the wood’s way of relieving this pressure. When the opposite happens, and a wooden structure starts sucking up moisture, it begins to swell. Wood is like a sponge, it can absorb, retain, and release water. When you use a chisel or similar tool on a piece of green (raw/wet) wood, sometimes water will spurt out. When will I notice these cracks and checks in my timber? It can really happen any time, especially if you’re using boxed heart timbers in your timberframe pavilion or building. You may notice some checking almost immediately as the outer layers begin to dry. Every species dries out at a different rate, but on average, timber air dries at about 1 inch per year. You’ll see cracks and checks appear as this happens. You’ll probably notice this happening most in the summer, as the heat dries the timber faster. It’s especially noticeable in outside structures and furniture. The most interesting thing to note is that most of these cracks and checks are temporary and will close or at least shrink when the center is dried out to the same level as the atmosphere surrounding it. 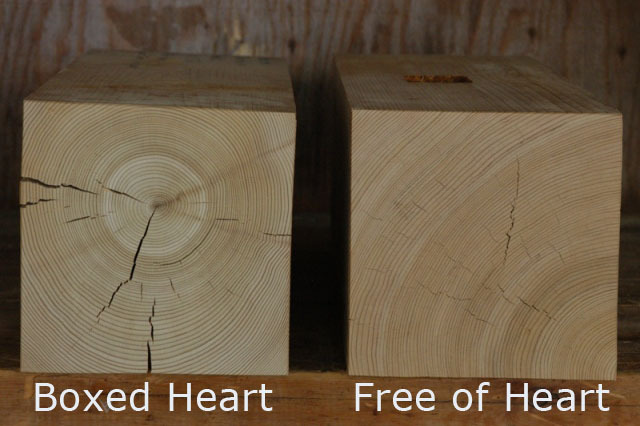 Side Note: “Boxed Heart” timber vs “Free of Heart” timber. Boxed heart timber is cut around the heart of the tree, so that its heart in the center of the logs. Checking occurs more regularly in this cut of timber because the center stays moist for so long. Free of heart timber means there is no (or very little) moist heart in the wood, so there’s typically less checking. To avoid using the “heart” in the timbers, the timber must be cut in a specific way, and usually from very large trees. But seriously, should I be worried about all these cracks in my timber? Probably not. If anything, checks and cracks actually help improve structural integrity because it releases the tension and pressure built up by shrinking wood. However, if a wood beam has split all the way through, you’ll definitely want to investigate further and test structural integrity. If the checking of timber makes you nervous, you could use dried timber in your building. This means utilizing reclaimed wood that’s had years to dry out or choosing kiln-dried wood, both of which minimize checks. Also, dried timber does offer some benefits. For one, insects and organisms that cause decay can’t survive well in low-moisture wood. It also allows for better penetration of preservatives and finishing products. Last but not least, it can be stronger and provide better insulation than green wood. Choosing free of heart wood over boxed heart grade. Utilizing housed joinery where possible. Applying a wax based end sealer to end grain, which helps slow the drying process. Allowing for slower drying of the timber when your structure is complete. (Meaning don’t immediately blast the heat or air conditioning. TL;DR: Timber is supposed to have cracks and checks! To summarize – checks and cracking are a natural part of timber frame buildings and add character and uniqueness to your structure. They do not compromise structural integrity and will most likely close or shrink as the timber dries over time. It’s just a natural side effect of the wood’s inclination to reach equilibrium with its surroundings. 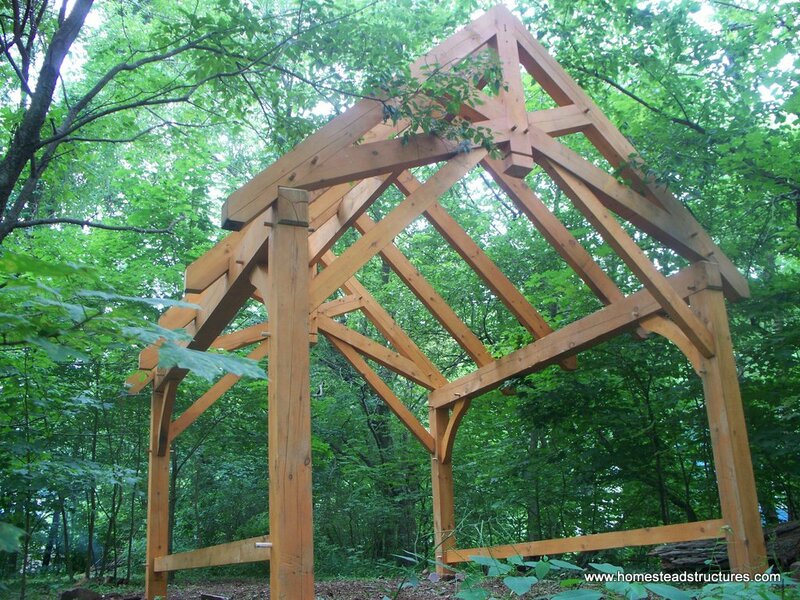 Call us at 877-272-7252 or contact us here to learn more about our timber frame structures!